OTTAWA – February 19, 2014 – Recycle My Cell, Canada’s national recycling program for mobile phones and accessories, announced today the winners of the fourth annual Recycle My Cell Student Challenge. In collaboration with the 2013 Waste Reduction Week in Canada, the Challenge invited students from kindergarten to post-secondary to collect as many old wireless devices as possible, including cell phones, smartphones, wireless PDAs, pagers, accessories and cell phone batteries. More than 140 Canadian schools from across the country participated in the 2013 edition of the Challenge, which was held from October 21 to November 22. The schools collected more than 3,500 wireless devices along with some 200 kilograms of wireless accessories and batteries. The school that collected the most wireless devices in each participating province and territory, based on student population, will receive a $500 donation to support the school’s green initiatives. 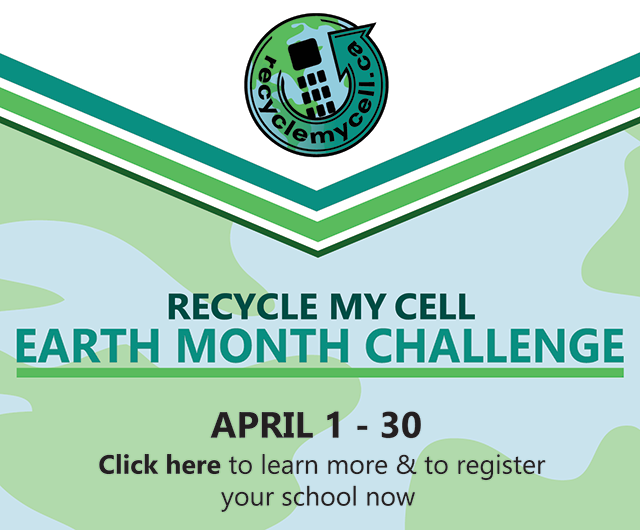 Recycle My Cell thanks all of the schools that participated in the 2013 Challenge. For information about future Challenges, please contact info@recyclemycell.ca. If you are interested in hosting a year-round Recycle My Cell collection site in your community, please visit https://www.recyclemycell.ca/host-a-drop-off-location. Recycle My Cell is made possible with participation from: Bell, BlackBerry, Eastlink, GEEP Inc., GREENTEC, LG Electronics Canada, Inc., Lynx Mobility, MTS, Nokia, ProMobility, Rogers Communications, Samsung Electronics Canada Inc., SaskTel, Sims Recycling Solutions, Sony of Canada, TBayTel, TELUS, Videotron and Virgin Mobile Canada. Recycle My Cell is Canada’s national recycling program for mobile phones and accessories. The bilingual Web site – www.RecycleMyCell.ca and www.recyclemoncell.ca – allows consumers to simply enter their postal code to locate the 10 drop-off locations closest to them where their devices will be accepted, regardless of brand or condition. The free program is run by the Canadian Wireless Telecommunications Association (CWTA), in conjunction with cell phone carriers, handset manufacturers and approved processors, who have come together to raise awareness about the importance of cell phone recycling. About Waste Reduction Week in Canada ? Waste Reduction Week (WRW) in Canada was developed in 2001 by a coalition of 13 recycling councils and sister organizations from across Canada and is delivered each October by the same group. The program’s goal is to inform Canadians about the environmental and social ramifications of wasteful practices. WRW uses its “take action” messaging to empower all Canadians to adopt more environmentally conscious choices. Waste Reduction Week provides Canadians with information and ideas to reduce waste in all facets of daily living, creating solutions to the many environmental challenges we face. Learn more at www.wrwcanada.com. Follow us on Twitter. Like us on Facebook. © 2019 Canadian Wireless Telecommunications Association. All Rights Reserved.